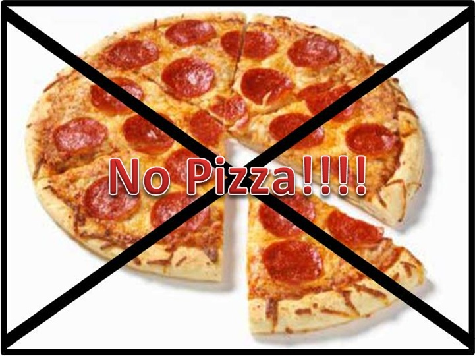 Michelle Obama: No Pizza for You! Michelle Obama has a new way to change the diet of Americans: give up your pizza for Barack! and yet you still find the time to help out when you can. May have a tight budget? And the Dems call Romney out of touch? Michelle’s dream scenario: the family gives up pizza and slims down so her husband can be reelected. Her concern is misplaced, though; her husband’s economic policies are making it harder and harder to put food on the table. We’ll all be slim sooner than she thinks. P.S. — It meant a lot to me to speak with you and everyone else last night. Thank you for everything you do. And thank you, Michelle. Just one question: the next time you take one of your hundred-thousand-dollar vacations and eat at one of them ol’ fancy restaurants can you bring a doggie bag? Ah’m hungry. P.S. – Don’t tell Barack it’s a doggie bag. There’ll be nothing left for me.